Jenny Craig versus Weight Watchers: You want to lose weight, but with dozens of diets out there, how can you tell which will work best for you? While some of this comes down to trial and error, many people start with one of the most advertised diet plans today: Weight Watchers and Jenny Craig. No single diet is “best” for everyone, as a diet should fit your unique needs, personality, and lifestyle. Weight Watchers (reviews, specials) uses a system of SmartPoints to help dieters lose weight. Each member can consume a certain number of SmartPoints based on their height, weight, age, and gender. Each food or drink has a SmartPoints value based on calories, saturated fat, sugar, and protein. Jenny Craig (reviews, coupons) gives pre-packaged meals and snacks to dieters so they can diet on autopilot. The goal is to practice healthier eating while on the Jenny Craig items, then slowly return to normal foods. Which system works best for you depends on your personality and lifestyle. Do any of the following statements sound like something you would say? If this is you, Weight Watchers could be the way to go. Weight Watchers offers weekly in-person meetings where members talk about their weight loss issues and help each other stay on track. Additionally, both Weight Watchers and Jenny Craig offer plenty of opportunities to socialize with other dieters online. Since you won’t have to cook or crunch numbers while using the Jenny Craig system, it’s great for people with hectic schedules. While Weight Watchers also offers optional prepackaged meals, they do need dieters to keep tabs on how many SmartPoints they consume and learn a bit about nutrition from the start. *See Jenny Craig’s best promotion now! The goal with Jenny Craig is that each dieter will learn about nutrition over time, but at first, they just need to eat the pre-made meals offered through the program. If you have significant food allergies or special dietary needs, Weight Watchers should be the better diet for you. Jenny Craig offers pre-made foods for the typical dieter, so it’s not as easy to customize as Weight Watchers. Weight Watchers lets you eat what you please, as long as you stay at or below your SmartPoints budget. There are no banned or required foods, so eat whatever you want as long as the points add up! If crunching numbers frustrates you, you may want to try Jenny Craig. Since the program gives you prepackaged meals, there’s hardly any math involved. Weight Watchers, on the other hand, is based on counting SmartPoints. Members are encouraged to use a food diary or app to keep track of how many SmartPoints they take in. There’s no complex math, but there can be a lot of tallying. If the idea of tracking points for every meal isn’t appealing, then Weight Watchers might not be the diet for you. Up to 50% off with today’s new customer promo! Weight Watchers is great for people who love cooking because you start out eating your own grocery store food from day one. There’s a ton of free WW recipes online, and people post new WW recipes to sites like reddit and Skinny Taste every day. With Jenny Craig, you start out eating foods provided by the program, so unless you have someone else to cook for, you won’t be spending much time in the kitchen. If you like to cook, then mark a point for Weight Watchers. If you are busy and prefer the idea of a “grab and go” meal, then advantage Jenny Craig. 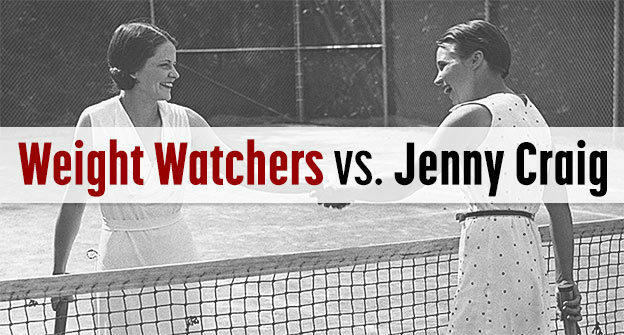 Jenny Craig versus Weight Watchers? That’s a Personal Choice! While Weight Watchers is rated higher by experts, neither Weight Watchers nor Jenny Craig is right for everyone. You need to consider what would be a good fit for you. The happier you are with your diet, the less likely you are to cheat.